NXT Geek: New Touch Panel for the NXT!!! Fits over the NXT Brick LCD. 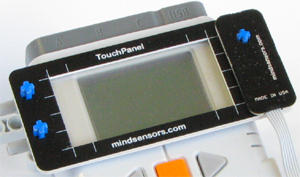 Corresponds Touch Points with LCD pixels. Provides 8 virtual buttons on sides. You can know buy one for just $49.95!!! Click here to go to the Mindsensors website and order yours.